Thursday could very well be the final time that Connecticut’s Kia Nurse, Gabby Williams and Azurá Stevens can call themselves teammates. The same goes for UCLA’s Jordin Canada and Monique Billings. In all likelihood, these college teammates will head to different cities to begin their professional careers. There’s an outside shot Chicago could land a pair with back-to-back picks at Nos. 3 and 4, but that much is uncertain. While they may go their separate ways on Friday to visit their respective teams and prepare for their rookie season, the college teammates have together been able to enjoy the Draft process and celebrate the accomplishment of making it to the next level with someone that was with them for the past four years (two years in the case of Stevens at UConn). Billings says Canada “is like my sister.” But in true sibling rivalry form, she was quick to point out that when she and Canada did find themselves on opposite sides of the court last summer, it was Billings’ squad that got the W.
While UCLA hasn’t had two players selected in the same WNBA Draft since 2006, it is nearly a yearly occurrence for the University of Connecticut to send multiple players to the WNBA, including the unprecedented 2016 Draft that saw Breanna Stewart, Moriah Jefferson and Morgan Tuck taken with the first three picks. Nurse and Williams teamed up with that trio for the first two years of their UConn careers, then closed out their incredible collegiate run together at this year’s Final Four. 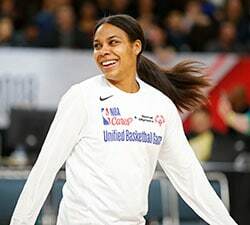 While it was no surprise that Nurse and Williams would be headed for the Draft this year, Stevens was a late entry into the field, as she chose to forgo her final year of college eligibility and turn pro, giving UConn three players that will likely go in the first round. How Well Do You Know Your Teammate? 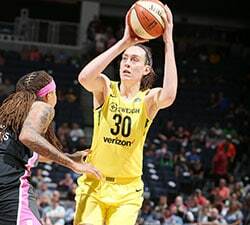 WNBA.com had a chance to speak with the 10 Draft invitees this week…and we wanted to test just how well these college teammates knew one another. So we had each player describe themselves and their teammates in three words so we could see how well they would match up with one another’s answers. Canada described herself as an introvert, competitive and joyful. How well did Billings know her point guard? When it was her turn to describe her teammate in three words, Canada used spiritual, competitive and unique to describe Billings. She came close to Billings’ self-assessment of vibrant, free-spirit and bubbly. You could definitely tell that these two have spent the past four years together. When it came to describing Nurse, the responses from her UConn teammates were very similar. 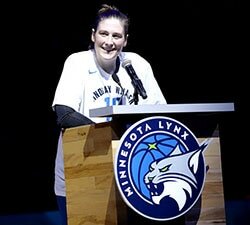 The only player that got a universal response in a single word was Stevens — as Nurse, Williams and Stevens herself called the 6-6 forward “child-like.” Both Nurse and Williams pointed out how Stevens loves to laugh, which play right into her word of “joyful” to describe herself. Williams is known for being a huge Marvel fan and when it came time to describe her, Stevens thought that was the perfect word for her teammate. Best wardrobe? Most likely to dance in a Beyonce video? Most likely to survive the Hunger Games?